Mirova reduces carbon footprint on its consolidated equities portfolio from 3.5°C to 1.7°C in just over two years. Mirova is now within the 2°C trajectory across asset classes as defined by the international community. Mirova, an affiliate of Natixis Investment Managers, today announces that it has successfully reduced its carbon footprint on its consolidated equities portfolio from 3.5°C to 1.7°C achieving the goals set out by the Montreal Carbon Pledge and Portfolio Decarbonization Coalition initiatives. Mirova is also now within the 2°C threshold across its asset classes as defined by the international community and highlighted in 2015 at COP 21 (United Nations Climate Change Conference) in Paris. Today there is an international consensus on the fact that temperature increases must be limited to 2°C in order to avoid the most serious effects of climate change and reduce greenhouse gas emissions in the future. To meet these commitments, Mirova has developed a methodology that makes it possible to measure the climate footprint of its investments, along with that of the main market indexes. The methodology, unlike most approaches developed previously, adopts a ‘lifecycle’ vision of the carbon footprint, taking into account emissions associated with a companies’ products and services. The impact of these on the climate is crucial in many sectors, whether positively—in particular for renewable energies and energy efficiency solutions—or negatively, such as for fossil fuels. This methodology makes it possible to calculate, at the project, company or portfolio level, a final measure of compliance in accordance with the climate scenario. 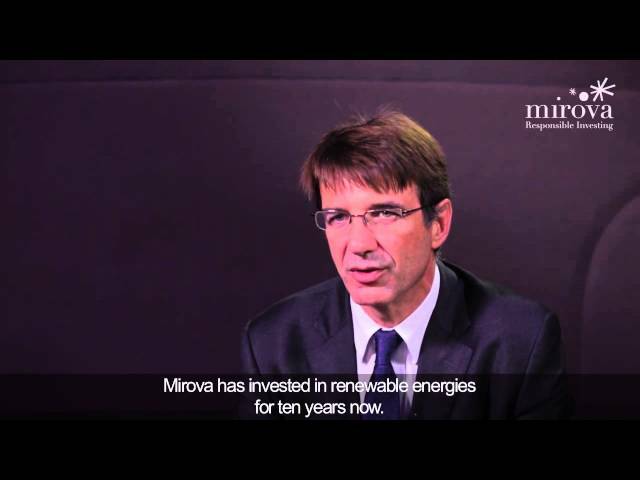 “In order to decrease the carbon footprint of our portfolios, we looked for values that were present all along the value chain of renewable energies and energy efficiency, as well as listed mid-sized companies not represented in the indexes,” explained Hervé Guez, Global Head of Research and CIO of Equities & Fixed Income at Mirova. “These efforts demonstrate our willingness and ability to meet our commitments and to offer our clients solutions that bring together a strong focus on environmental and social impact along with high performance,” Mr Guez added. In 2015, Mirova’s consolidated equities portfolio was at 3.5°C and although substantially lower than the level of the reference stock indexes (5°C for MSCI Europe and 4.9°C for MSCI World was still too high. By steering the carbon footprint even more precisely, the teams succeeded at gradually reducing the number even further, while continuing to strive for strong performance. A broader, more transversal vision of environmental issues has made it possible to identify companies that provide solutions in all sectors of activity. The carbon footprint of Mirova’s consolidated equities portfolio is currently 1.7°C.